Claims about Rent to Own – What can you believe? Shortly after I published the first article in my series on Rent to Own, a reader responded with a number of comments. There are some good questions embedded in this person’s response, so I have copied the comments in full (as received), in blue, with my responses in black. Please feel free to join in the conversation and add your own comments or questions. Thank You for talking the time to write this article. I do find it to be somewhat offensive to the Professional RTO dealers offering this as a financial solution. Most of the statements shared as “facts” about the RTO business are personal Opinions. To me, it sounds like the writer was offended by another Lady being successful in Rent to Own. Using words like “pitched” and “purveyors making all sorts of claims” sort of give the readers this indication. The writer being in the RTO business for 10 years is not as important and the number of successful RTO programs the writer has completed. If they were unsuccessful programs for the writer, it surely has nothing to do with the “concept of RTO. I know of many many successful RTO programs. I have been invited to present to thousands of Realtors and mortgage agents over the past decade in order to show them that Rent to Own can be done ethically, and further, that it can be an effective strategy to help clients rebuild their credit, if done properly. In the opening paragraphs of my initial blog post, I state that RTO can be an effective strategy, but what concerns me is the hype that is sometimes used when discussing this as an investment option. Hype and real estate do not mix. Real estate investing of any kind should be about a clear-eyed, fact-based evaluation of the numbers, risks, and opportunities using conservative estimates and approaches. With respect to the suggestion that I am offended by another lady’s success, I point out that I am now entirely focused on ensuring women’s financial success. A quick look at my website will show that I am a strong proponent of women and investing. What I am actually cautioning against in my original post is hype and the suggestion that Rent to Own is so easy. The so-called easy part of RTO is putting the deal together. The hard part is everything after that – getting the clients through to a successful close in which they are left in a strong, stable financial position, with a good credit score, owning a home for which they have paid a fair, market price. This is what I discuss at length in my series, based on significant experience with successful deals. Most Lenders won’t touch RTO deals??? Most Banks will…Mortgage Agents get upset because the Banks that do accept the RTO Exit Mortgages do not pay a referral fee. The Monoline Mortgage lenders do pay commissions to Mortgage Agents but they are turning their back on RTO exits. The critical thing to know is CMHC does support RTO exits. My most recent successful close in an RTO deal took place less than three weeks ago. For this file, my business partner and I worked with one of the most able mortgage agents we know, Erica Vincelli of The Mortgage Advisors. Erica has worked wonders on our most difficult profiles, managing to get deals completed where others couldn’t. After receiving this comment, I gave Erica a call and asked her what she thought of my comments. She concurred; finding lenders for RTO buy-outs is a real challenge and you simply can’t do it in some cases. Not sure how the writer structured their RTO’s but based on some of the statements like “6.5% Minimum” at the end tells me there are gaps in their program. What if the client started with Bruised Credit? They surely need more than 6.5% at the exit. No wonder the mortgage agents the writer is dealing with is having issues getting financing done at the end. The lending requirements in place today are vastly different than the ones we faced ten years ago. The financial meltdown of 2008 changed everything. Since we worked closely with multiple mortgage agents, we continually refined our systems to ensure the success of our clients, including adjusting the amount of down payment required on a case by case basis. That, in part, is why we successfully closed all but two deals out of dozens. The two that failed did so because, in the first instance, the clients decided they no longer liked the house and they walked away without entertaining any alternatives. In the second case, the family failed to follow our credit repair advice, despite quarterly reviews and semi-annual checks of their credit bureaus. They continued to amass debts, stopped paying the rent and had to be evicted. Their case ended up at the Tribunal, before a judge, where we obtained a ruling in our favour. The comment, “What if the client started with bruised credit?” is interesting. The vast majority of our files involved bruised credit. It’s not often you see Beacons of 680 or higher in the world of RTO. When you do get a good Beacon score, there’s often a partner or spouse with a difficult bureau. That wouldn’t be a problem if the person with a good score had sufficient income to purchase a house, but if that were the case, they wouldn’t be turning to RTO. No client wants to do RTO unless they have to because it increases their cost of ownership. 1. 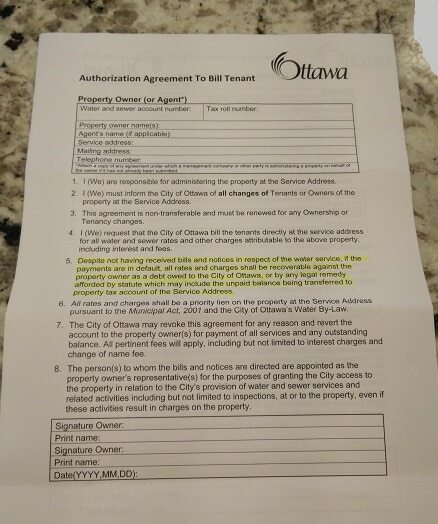 The statement “As for no toilet issues, you might want to consult a lawyer who is familiar with the residential tenancy act that governs rentals in your province” . My recommendation to the writer is that they should read the RTA revised in 2006…the RTA does not have jurisdiction over Rent To Own. 2. The statement “When we consulted a lawyer who specializes in landlord/tenant issues”. Did this lawyer also specialize in RTO contract law? Create a single document in which the details of the option to purchase and the tenancy are outlined. Create separate documents: a lease agreement and a separate option to purchase document. If you create a single document referencing both the tenancy and the option to purchase, then you may have great difficulty evicting the tenants in the event that they stop paying rent because, as the documentation will show, they have an equitable interest in the property. The process of regaining vacant possession in the case of persistent non-payment of rent will be a costly, lengthy one without a guarantee of success. With respect to repairs, if there is a tenancy agreement, even when combined with an option to purchase, there is a landlord’s duty to maintain the property in a reasonable state. If you proceed with the second approach, as we did in our system, you have clear, distinct documents addressing the tenancy portion and the option to purchase at the end. The RTA applies to the rental agreement without comment on the Option. This method allows you to proceed with eviction if you have a case where your tenant-buyers stop paying. If my reader obtains a different ruling or advice from his/her counsel, I welcome that information and will happily share it. 3. The Statement “After running a Rent to Own company for nearly ten year”. Given that most RTO cycles are 3 years and given the writer is painting RTO with a very negative brush, why did the writer stay in the RTO business for 10 years? Our deals ranged from two to five years, with most deals successfully closing in three years. I made money on all but two deals, as referenced above. I chose not to continue with Rent to Own for a variety of reasons, most of which I discuss in this post, but it boiled down to a lower ROE – Return on Effort – than I’m happy with. Time is my most valuable asset, and I’m choosing to use it for investments that are not as time-intensive while still providing strong financial returns. I look forward to the next article where you say you will address more of the enumerated claims above. 1. CMHC does not require the deposits to be 100% refundable so the Mortgage Agent is not correct. CMHC underwriting can be contacted directly to confirm. I encourage readers to contact CMHC Underwriting for clarity. 2. The Landlord Tenant Board can also be contacted to confirm their jurisdiction over Rent to Own and the RTA. Rent to Own is a great vehicle to help families and a safe investments for Investors. Last year, I was invited to have a meeting with a representative from CMHC during which we discussed their policies, requirements, and RTO, at length. I have reached out to the representative once again and will provide her update as soon as we’ve spoken. With respect to your second point, I have a call out to a legal firm that specializes in landlord and tenant disputes with a request for an interview. I will publish the details of that interview as soon as they are available. 1. This is not a product created for investors, but rather to help Canadians get access to housing. CMHC is here to meet Canadians’ needs, not their wants. 2. The Rent to Own policies were created for landlord-tenant situations where a landlord already has a tenanted property and the tenants decide they really like the house and want to buy it down the road. It was not designed to help investors with their business, nor to support Rent to Own as a business model. Stephanie is concerned with the tenant-first approach. 3. CMHC sets their policies and they are interpreted differently by lenders. The interpretation varies case by case. 4. CMHC wants to see two clauses included in the Offer to Purchase. First, the savings portion must be above and beyond the average market rent. This is to protect the landlord and to ensure that there is no seller’s incentive. Second, while they would ideally like all of the deposit to be refundable, at the very least they want to see the majority of it be refundable should the tenants choose not to purchase the home. Since the tenants paid fair market rent, they deserve to receive most of those funds back. Essentially, CMHC wants this to be set up like a deferred sale process.